Shower wall panels, wet wall panels or bathroom wall panels, whatever you call them they’re one and the same thing. Put simply they’re a waterproof alternative to tiles for your bathroom or shower space. But are they any good? More often these are purchased in a showroom rather than online, that is unless you have a direct trade account with a manufacturer. People struggle to understand how they work or how they’re fitted into your bathroom. To give you confidence in purchasing bathroom wall panels online here is our complete guide. This will help you to understand the various waterproof shower panels available on the market. We understand you’re only interested in what’s right for your bathroom. We also spell out the accessories you do need and those that are optional for your installation. As with any product on the market there are always options for consumers. Not all wet wall panels are equal. Indeed there are budget, mid range and premium offerings available. What Are Shower Wall Panels made Of? Above anything else it’s the construction type of bathroom shower panels that will dictate the price. There are 3 main types, PVC, Acrylic and pressure laminated Vinyl on an MDF core. Here is a brief overview of each. The PVC variety of panel is generally the cheapest available. Polyvinyl chloride or PVC is the worlds 3rd most common type of synthetic plastic. Its cheapness and ability to be formed into rigid or flexible forms makes it perfect for use as a shower wall. PVC sheets tend to be lighter than than the acrylic or MDF counterparts. That’s because the core isn’t a solid mass, instead it has a vertical cuboid type construction. See the diagram below. Above all PVC constructed bathroom panels have brought what was a high end only bathroom product to those with smaller budgets. The designs do tend to be simpler but nonetheless they offer all the same benefits of a premium product. These type of panels are used in commercial environments as well as domestic. Brands to look out for include Basix and Splashpanel (both from the Showerwall stable), Aquatech and the Essential range from Frontline Bathrooms. The Aquatech PVC wet wall panels are good value as they’re sold in packs of 2 and are perfect for waterproofing a piece of wall the size of your shower cubicle. Acrylic bathroom wall panels like those from Wetwall are the slimmest of the bunch at around 4-5mm. Even though they’re slimmer they’re generally heavier than PVC panels given their denser acrylic construction. Acrylic panels are often produced in bolder colours and they can also be semi-transparent. Like PVC they’re durable and hygienic. There are deals to be had but Acrylic panels tend to be more expensive than PVC panels. The weight often means they’re more expensive to deliver too. MDF constructed waterproof shower panels like those from Showerwall are the thickest, heaviest and perhaps the best constructed shower panels available. All this does come at a premium though over cheaper materials. The MDF core has a high pressure laminated backing on both sides making the panel completely waterproof. Like the PVC and Acrylic types they are also durable and hygienic. They’re available in all manner of designs from classic marble to modern designer patterns and you can even supply bespoke images for something personal and unique to you. Be aware though, you’ll need deep pockets as bespoke shower panels can cost up to £800 per panel. You’re essentially comendearing the entire manufacturing process for a period of time for just your panel. 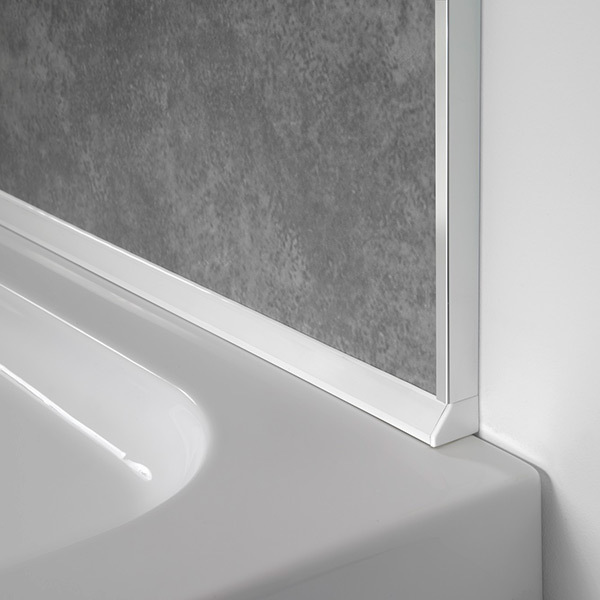 What Surfaces Can Bathroom Wall Panels Be Fitted On? In a domestic environment pretty much the same as what other wall cladding materials like tiles can be fitted on. However shower wall panels are a little more forgiving with uneven surfaces. You can also fit shower panels directly over existing tiles or wall coverings. 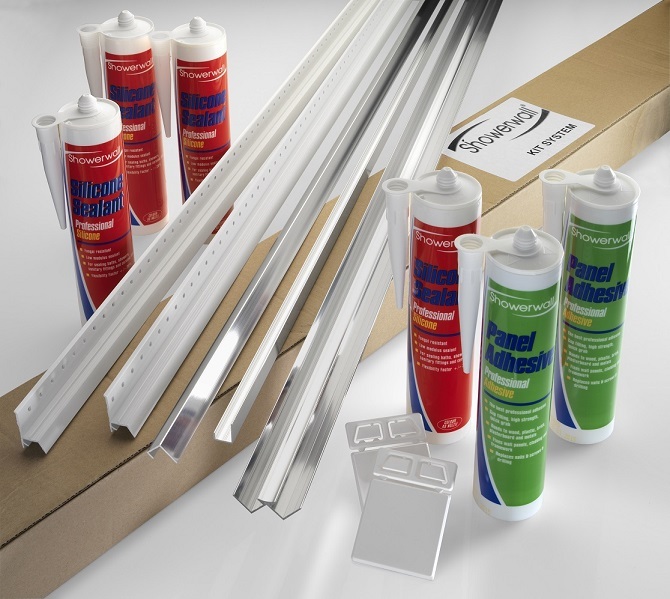 In commercial properties depending on the wall construction you may need to affix them to batons. Some contractors also fix them directly to the stud wall without involving plaster boards. Tradesman will generally have the knowledge to advise on this. In a domestic environment as with any new covering you’ll get the best installation with a smooth newly plastered and sealed wall. So you know what kind of walls you can fit them to but how do you go about fitting shower wall panels? The procedure will differ slightly depending on the material construction. They will also differ between the advice given by manufacturers. On the whole the procedure won’t stray too far from the video below included courtesy of Showerwall. What Are The Benefits Over Tiling? Lets get one thing clear, there’s nothing wrong with traditional tiling in your bathroom. The vast range of styles, options for all budgets and the sheer availability will continue to make them a good waterproof option for lots of people. The surface of all shower panels whether acrylic, PVC or those with an MDF core are completely waterproof. The only one potential Achilles heel is where panels join each other side by side, in an internal or external corner or at the foot of the panels. It’s important that at these points the panels are completely sealed. Also ensure that you purchase or that your fitter supplies the genuine shower wall panel trims and joints from that manufacturer and not from a 3rd party. That way water will not find it’s way through. Brands like Showerwall even have a dedicated bottom sealing strip called ‘Sureseal’. Put simply this forms a seal between your shower tray or bath for instance and the bottom of the panel, with sealing points in no less than 4 places. No water will get through this if fitted correctly. See the brief video below. As discussed previously one of the benefits of bathroom wall panels is the quick coverage they afford. Shower panels are generally available in either sheet like panels or thin strips about the width of laminate flooring. Both can be quickly fitted. 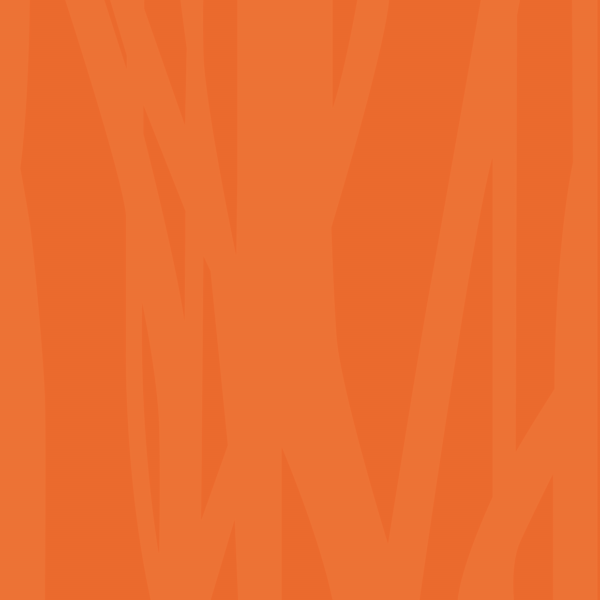 The likes of Showerwall and Wetwall offer panels in widths of around 600 – 1200mm. The average width for the various ranges available tends to be about 1000mm. 2 of these is usually adequate for most corner shower enclosure installations. Though you might possibly need 3 plus a joining trim for larger walk in shower installations. These panels sometimes have the option of a tongue and groove fixing or a square edge. A square edge is fine for corner installations. The height of waterproof shower panels ranges from 2000-2400mm. At least 400mm above most shower cubicles. The thinner packs, many of which can also be fixed to ceilings, are generally around 300mm wide by 2000mm in length. These usually have a tongue and groove fitting to ensure they are completely waterproof. It’s fair to say that there are a lot more styles of tile available than shower wall panels. Remember though this is a relatively new market. With that in mind there is a decent amount of choice available. The cheaper brands tend to focus on popular selling lines like plain white or black panels or the best selling white sparkle. Traditionally marble styles have also been popular with older buyers. The Wetwall and Showerwall brands have shaken things up a little with bold and exciting designs to try and attract a younger buyer. 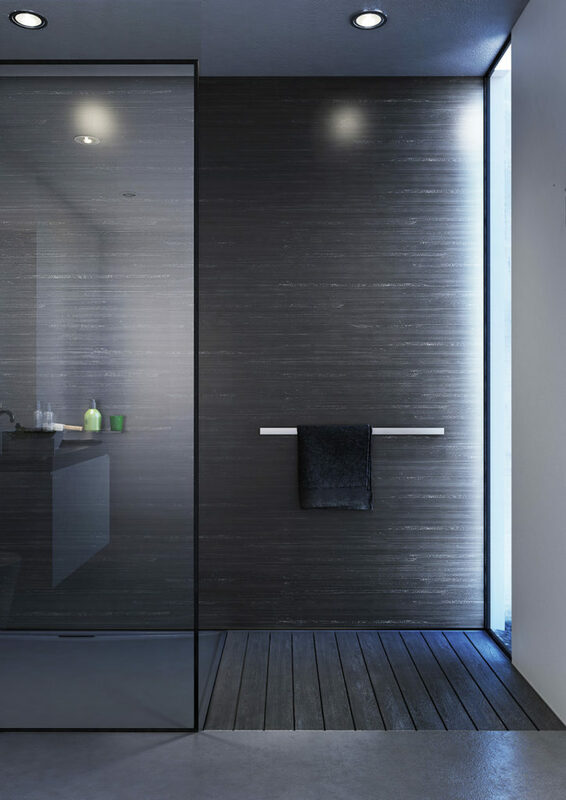 Showerwall have introduced designer ranges such as the Infinity range from Showerwall which includes Whispering Grass designed by internationally recognised designer Lars Contzen. This range is available in both bold and metallic colour options. More recently (Mar 2018) new Marble, Quarry, Mineral and Acrylic collections have been added. 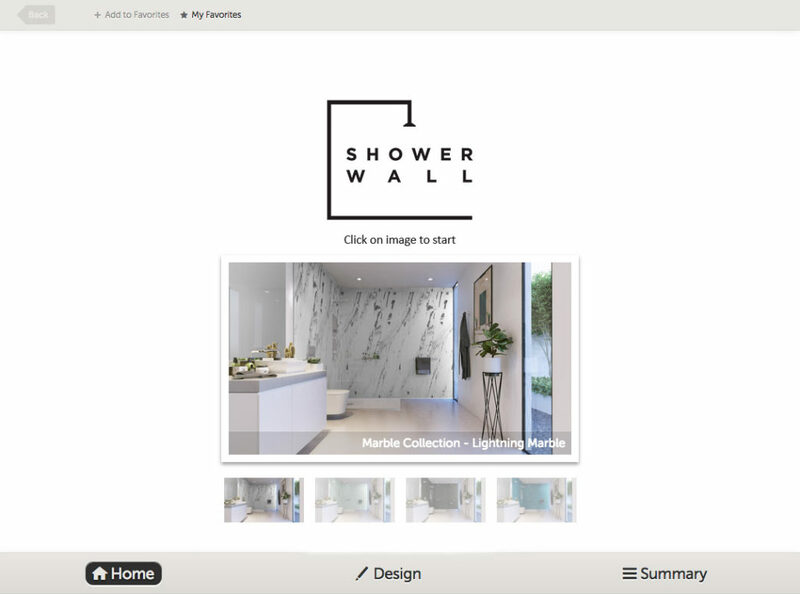 What’s more you can play with their online visualiser App to try different finishes in a virtual bathroom space. Most panels are generally flat but there are also designs being introduced which have a relief to more faithfully reproduces the material the panel is trying to emulate. If you want to go bespoke you can even have your own design or photograph blown up on to the panels. Note though this can be quite an expensive option. Of course there are also a few brands that specialise in reproducing the look of tiles with their panels. Big brand Mira is one such company. 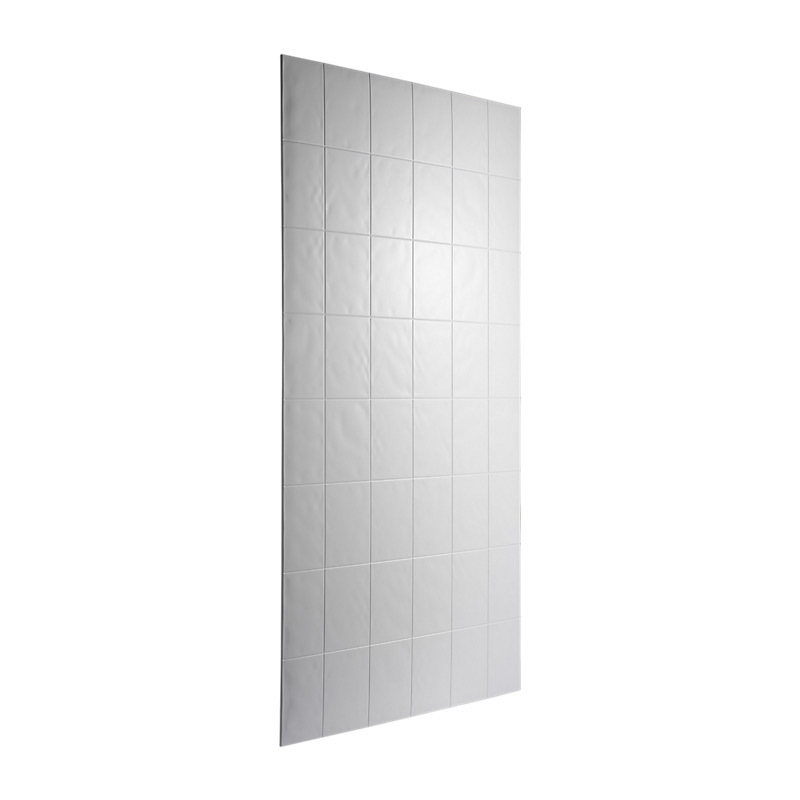 Mira offer simple tile effect panels that appear to be a rectangular white tile pattern. These are available in 3 widths and there are internal corner and side by side joining strips. Mira also offer matching faux tile splash backs for basins and baths so that you can follow the style throughout your bathroom. One other thing to note about the Mira tile effect wet wall is that they are only just over 2m high, a fair bit shorter than the alternatives on the market. These perfectly match the Mira Leap range of shower enclosures. Can You Fix Accessories To Shower Panels? This is one of the things that potential buyers ask all the time. Ultimately these panels are designed to go in a shower space where a shower valve and perhaps a shower head will be fitted to the wall. Plumbing works as well as bathroom accessories can all be fitted to shower panels. Obviously extra care in terms of sealing needs to be taken at the fixing points but this shouldn’t be an issue for a competent fitter. It should also be pointed out that while most panels can support light accessories anything where heavier weights are involved should be supported by a load bearing wall. Not the panel. We’re thinking about grab rails or things like shower seats which when in use could be accommodating over 100kg of downward force. 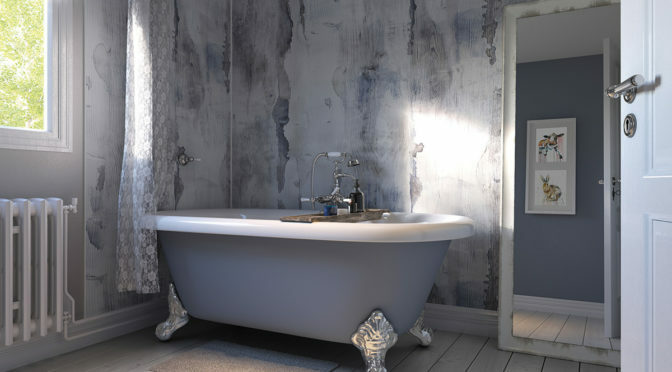 Wet wall panels can be installed throughout your bathroom. Like tiling they don’t have to be confined to just the wet areas. With range of joining trims available for most brands you can extend the panelling to every nook and cranny. The reality is though that most will want to install around a bath that doubles as a shower or for the walls within a shower cubicle to make them waterproof. With that in mind here is a list of the items you will need to make up a standard corner installation. This is the basic kit. Most manufacturers also offer cleaning accessories for removing excess silicon that may otherwise damage the panel surface. For maintenance dedicated cleaning fluids are also available. You can use standard cleaning products just ensure they aren’t abrasive. We hope this guide has answered all the most important questions you have about shower wall panels. If there is anything you still need to know no matter how ridiculous it may sound please fire away in the comment section below. We’ll reply as quickly as possible and also update the post if relevant. 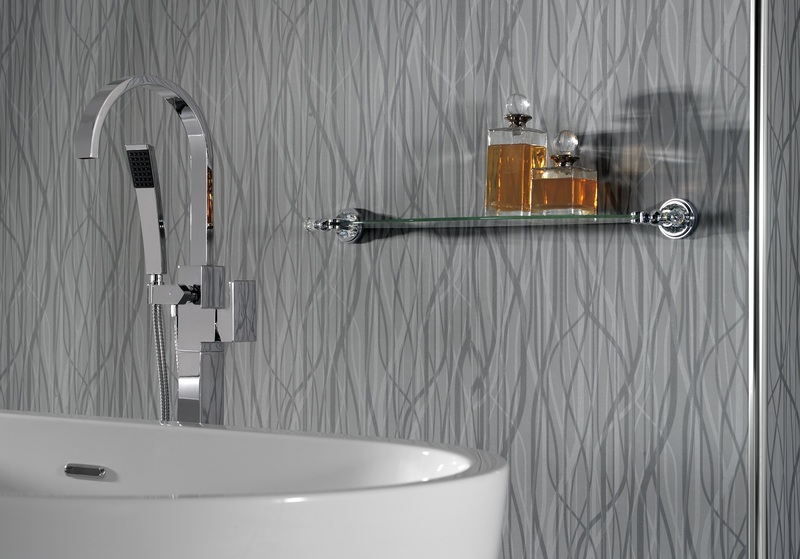 You can view our full range of bathroom wall panels here. My apartment has old stonw walls with only wallpaper on them. Which handyman would be best to ‘service’ my walls before I get wall panels installed. What characteristics would the wall panels need to be best suited to my old walls. And which type of wall panel would be ideal for me, I am reluctant to use PVC as I think it is not suitable for the job. I would appreciate a highly detailed response giving me the ideal ways in which I should go about preparing the stone wall and which panels would work the best. I do not know much so i hope you can at least point me in the direction of the information I need to know. If your walls have wallpaper on them then I’m presuming they’re already relatively flat and even? Furthermore that they’re dry? 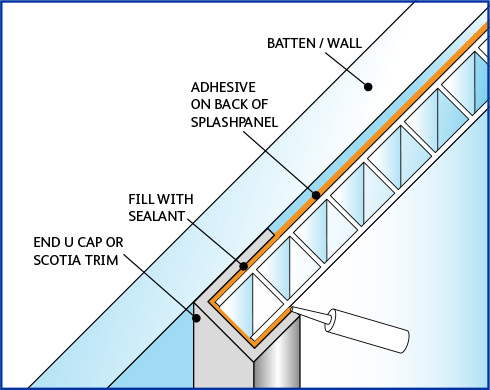 If so any wall panel can be affixed to the walls with a suitable adhesive. A handyman or tiler could do this for you. If your walls are bare stone and uneven then they will need batons fixing to them so that the shower panels can be fastened to a level and flat wall surface. If choosing Showerwall which has an MDF back then these can be fixed directly to the batons. Thinner PVC options will require an existing flat surface to affix to. You’ll need a skilled handyman or builder to sort this scenario for you. Hope this helps. My apartment has old stonw walls with only wallpaper on them. Which handyman would be best to ‘service’ my walls before i get wall panels installed. What characteristics would the wall panels need to be best suited to my old walls. And which type of wall panel would be ideal for me, i am reluctant to use PVC as i think it is not suitable for the job. I would appreciate a highly detailed response . Can I fix shower panels to polished porcelain tiles and what glue would I need and would pressure be required while glue adheres. Also would a different glue be required for attaching to wooden batons.